Though the bow gives us a great variety of expressive possibilities, the mechanics of sound creation with the bow can be reduced to just three elements: speed, pressure and sounding point. "Those three things are the only forces we can exert on the strings, and from the use of those, we get all the sound colors," said University of Cincinnati's College-Conservatory of Music (CCM) professor Kurt Sassmannshaus, in a class at the Starling-DeLay Symposium on Violin Studies at The Juilliard School in May. Sassmannshaus also is the founder of Violinmasterclass.com and the Great Wall International Music Academy. He also recently released the English version of The Sassmannshaus Tradition method books, first written in German by his father; and "Recital Album" Books 1 and 2, a book of first-position pieces for young students with teacher duets. Kurt Sassmannshaus. Photo by Violinist.com. When it comes to the bow, one common misconception is that the more pressure one puts into the string, the larger the sound it will make. It's actually not true; the amplitude of the string is actually wider when the pressure is less. Pressing down can actually disturb the vibration that you are trying to create, Sassmannshaus said. A string vibrates from two "nodes": the bridge on one end, and the nut on the other. Or, if a finger is stopping the string, the nodes are the bridge and the finger on the fingerboard. 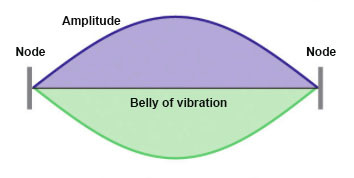 The "belly" of the vibration is in the middle, where the amplitude is widest. "We don't want to bow on the belly of the vibration," Sassmannshaus said, "we want to be close to the node." "These things have to be negotiated literally with every sound we make," Sassmannshaus said. "A good violin has a lot of sound colors. The sound colors are made with these tools." The bow operates by pulling and releasing the string over and over as it moves across it, like a thousand little pizzicatos. The string snaps back with each pull. The bow tugs at the string near a node (the bridge). In the video, you can see that the vibration that it creates is uneven and S-like, but when the bow is lifted, the vibration becomes even. That even vibration is what you'd get with a pluck, but then each note decays immediately. So the presence of the bow on the string actually interferes slightly with the vibration of the string. The farther away the bow is from the "node," or the bridge, the more it interferes. Changing bow direction requires a reversal of the "Helmholtz" vibration and can be noisy; releasing bow pressure can smooth it out. Many of our bowing techniques have French names, due in part to the seminal treatise on bowing technique written by French Violinist Lucien Capet. For example, "martelé," the word for a detached and accented bow stroke, comes from the French verb "marteler," to hammer. "Collé" comes from the French verb, "coller," to stick, or to glue. What exactly is collé? It's a very short stroke, done entirely with the fingers. "It's an exercise only, it's not a stroke you can use in a piece," Sassmannshaus said. "It's essentially a pizzicato with the bow." Martelè involves applying pressure to the string, leveraged between the index finger and the thumb, and then doing a rapid stroke. Many teachers like to avoid the word "pressure" and talk about putting "weight" into the string, as this helps students relax. But whether you call it "pressure" or "weight," it comes from the index and thumb, Sassmannshaus said. A point of trivia: the maximum pressure one can exert on the string is about two pounds, he said. For the martelé stroke, the pressure is only really exerted when the bow is not moving. For this stroke, the sounding point is different for each string: closer to the bridge for upper strings. "The ear has to decide which sounding point is right," he said, "it's different for each string -- and for each violin that we play." With practice, one can find correct sounding point automatically; it becomes second nature. For young students, Sassmannshaus recommended a piece called "March of the Little Soldiers" from his new "Recital Album" Vol. 1. Spiccato is a bounced stroke, in which the bow does most of the work. Try playing spiccato holding without the index or the pinkie, and that is one sure way to discover the bow's natural bounce. Études for practicing spiccato include: Kreutzer 2 (four spiccato 16ths on every note); Kreutzer 8 and Rode 8. By contrast, sautillé, a fast bouncing bow stroke, is more active. It always starts on the string. "It's a tremolo from the wrist; the arm is not involved," Sassmannshaus said. "The more you press, the more it bounces. You are forcing the bow into the elasticity." One exercise to try: start a tremolo in the upper half of the bow, then move toward the frog until it starts bouncing. I'm glad Sassamannshaus has published more studies that a child can play as duets with his or her teacher. When I was a child I had studies like that -- one was called "Selected Duets" in two volumes, and the other was Dont Op. 20. Playing those with my teacher was often my favorite part of the lesson. Thank you for the detailed notes, those of us who couldn't attend really appreciate it. I especially am glad you included the video of the string vibrating in slow motion, I have been looking for that video to show my students but couldn't find it! It was a pleasure! The vibrating string is a real revelation, definitely something cool to show the students! I learned so much of what he discusses long ago so that I don't know how I do it; this was very helpful, because, as I get older (stiffer, etc.) it's useful to revisit the how and make it work better.